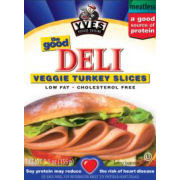 The MadHapa's World: Fake Meat Part One - "Turkey"
Fake Meat Part One - "Turkey"
Some folks around the office have decided to "go veg" on the advice of their doctor. I don't know if it's my reputation as a northwesterner or my gangly body shape, but somehow everyone knows I'm the resident expert on vegetarian cuisine. 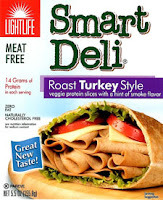 Recenlty I've been trying out vegetarian turkey slices. 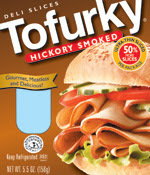 There are several different brands, but the easiest to find are: Tofurky, Yves, and Lightlife. I've been able to find one or all of these at: Trader Joe's, Albertson's, and Pavillions (Safeway). The original purveyours of turkey-that-is-not-turkey have a tolerable but disappointing product. The slices get tough after a few days in the fridge, and it has an over-bearing flavor. I enjoy Tofurky's carve-able turkey product, so I'm not sure what goes wrong in the conversion from loaf to slice. Perhaps that wild mushroom gravy has been masking it all along, or perhaps the Hickory-ifying is to blame. I am a longtime fan of the Lightlife product line - especially for Mexican food. The Smart Strips are great for fajitas and the Smart Ground is unbeatable as a ground beef substitute in tacos. The turkey slices aren't bad, but they aren't great. The taste is mild; the texture is moist without being slimy. If the choice is between Smart Deli and Tofurky, I opt for Smart Deli. But I prefer . . .
Oh baby. I could eat some of this right now - some pepperjack cheese, a little spicy brown, get in mah belly! Yves has a very mild pepper-y flavor which is complimentary to just about anything. When paired with a mild cheese, the flavor steps up and politely insists on being noticed. If you go for a gutsier cheese like smoked gouda or pepperjack, this "meat" is happy to hang out, unobtrusively in the background. I've included links to the nutrition information because I know salt and carbs are of interest to some folks and I only judged them on taste. The Yves product, much as I enjoy it, has 14% of your daily sodium per four slice serving. The good news is, four slices pretty much takes care of the job. I think there's room for newcomers in the fake turkey arena. 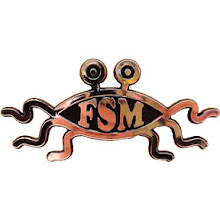 I'd also like to see Tofurky come out with a "new and improved" product. I will be the first person in Orange County to buy it. Don't These Idiots Watch Sci-Fi?